Parmesan crusted kale artichoke dip that’s extra cheesy and loaded with tender artichoke hearts. Serve this dip at your next holiday party and watch it disappear in minutes! Vegetarian. Now that Thanksgiving is behind us, I’m 100% ready to start celebrating the Christmas season. Who am I kidding, I’ve been ready since June. 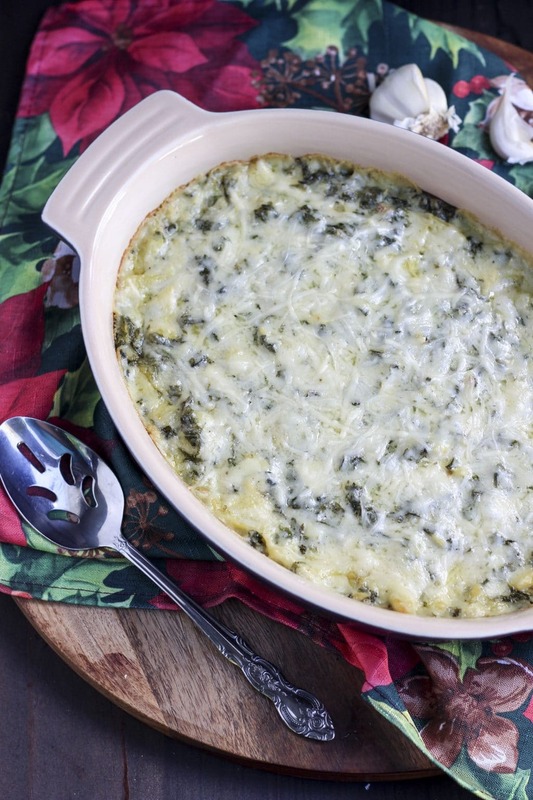 This kale artichoke dip is one of my favorite appetizers to serve at a holiday party, it’s definitely a crowd pleaser. 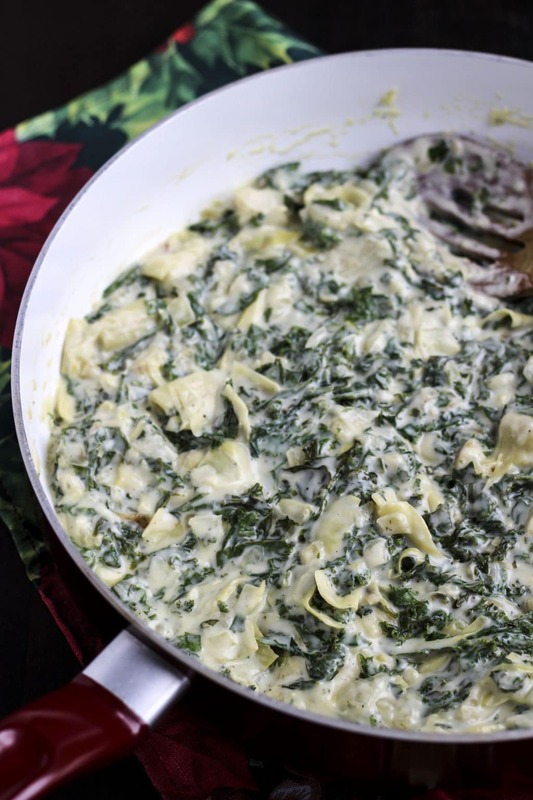 It’s loaded with mozzarella and parmesan cheese, big chunks of artichoke hearts, garlic, and tender ribbons of kale. You may be thinking this sounds a lot like spinach artichoke dip, and you’d be correct. 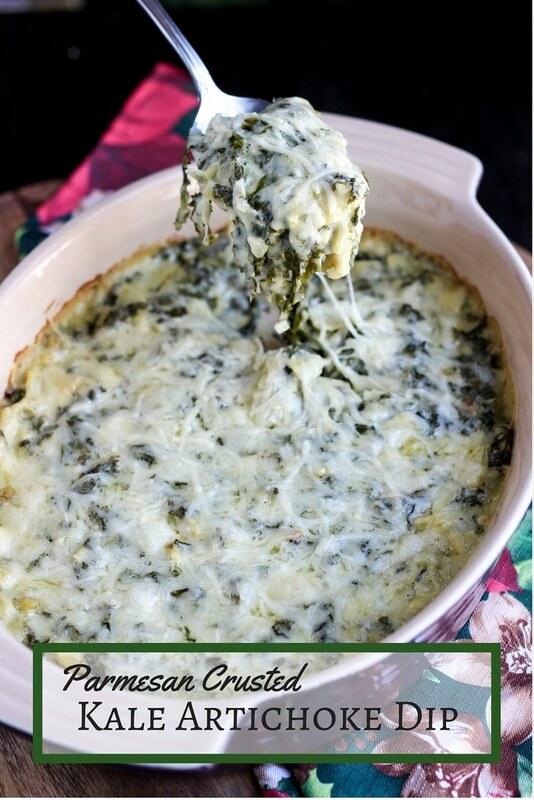 I made this recipe on a day I was craving spinach artichoke dip but had no spinach available and didn’t feel like going to the store. I did have a huge head of kale in the fridge, so that’s what I used. Boy, what a delicious problem it was! I sliced the kale into extra thin ribbons and sautéed it with onions. garlic and the artichoke hearts. It tastes similar to spinach artichoke dip, but I actually prefer this version to the original. I love getting a big bite of sautéed kale and a big, juicy artichoke heart that’s coated in cheese. Nom, nom, nom. Now it’s time for the fun part! After you’ve finished sautéing the veggies and making the cheese sauce, pour it into a casserole dish and top it with more parmesan cheese. Bake it for 25 minutes or until it’s bubbling and starting to brown lightly. When it first comes out, you’re going to want to dive right in and taste it, but don’t do it! You must resist! It’s boiling hot, and even though the mouthwatering smell has taken over all your senses, it will burn you! Believe me, I did it. Look at all that beautiful cheesy goodness! It has so much kale and artichokes packed in it that it’s practically a veggie dish, right? Bring this to your next holiday gathering, and you’ll be the most popular person at the party. I guarantee it. Parmesan crusted kale artichoke dip that's extra cheesy, and loaded with tender artichoke hearts. 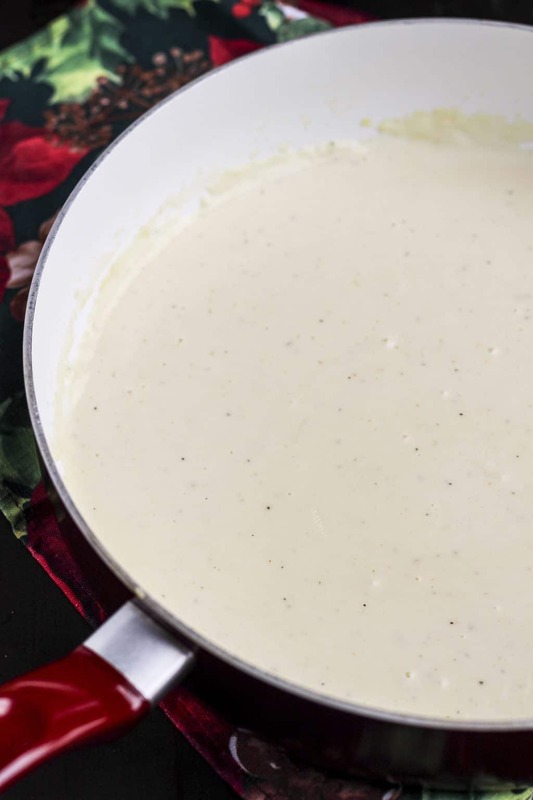 Serve this dip at your next holiday party and watch it disappear in minutes! In a large pan, sauté the diced onion in butter for 8-10 minutes, over medium heat. Drain and rinse the artichoke hearts. Give them a rough chop, you want to have large chunks. Add garlic and artichoke hearts to the pan, sauté for 2 minutes. Add thinly sliced kale, sauté for 2-3 minutes or until just slightly wilted. Set kale mix aside. Wipe out the pan with a paper towel. In the same pan, add 2 T butter. Once melted, add the flour, and stir for 2-3 minutes. Add the milk. Stir and let cook for 3-4 minutes until it starts to thicken. Add 1 cup mozarella cheese, and 3/4 cup parmesan cheese. Stir until melted. Add cayenne pepper, pepper and just a little dash of salt. The cheese is salty so you don't want to add too much. Cook for 2 minutes or until everything is fully melted and combined. Add the kale mixture into the cheese sauce. Stir to coat the kale in the sauce. Preheat the over to 375 degrees. Pour the dip into a small casserole dish, sprinkle 1/4 cup parmesan cheese on top. Bake for 25 minutes, or until hot and bubbly, and starting to lightly brown. What’s your favorite vegetarian dish to bring to a holiday party? Let me know in the comments! « 25 Fabulous Foodie Christmas Gifts!